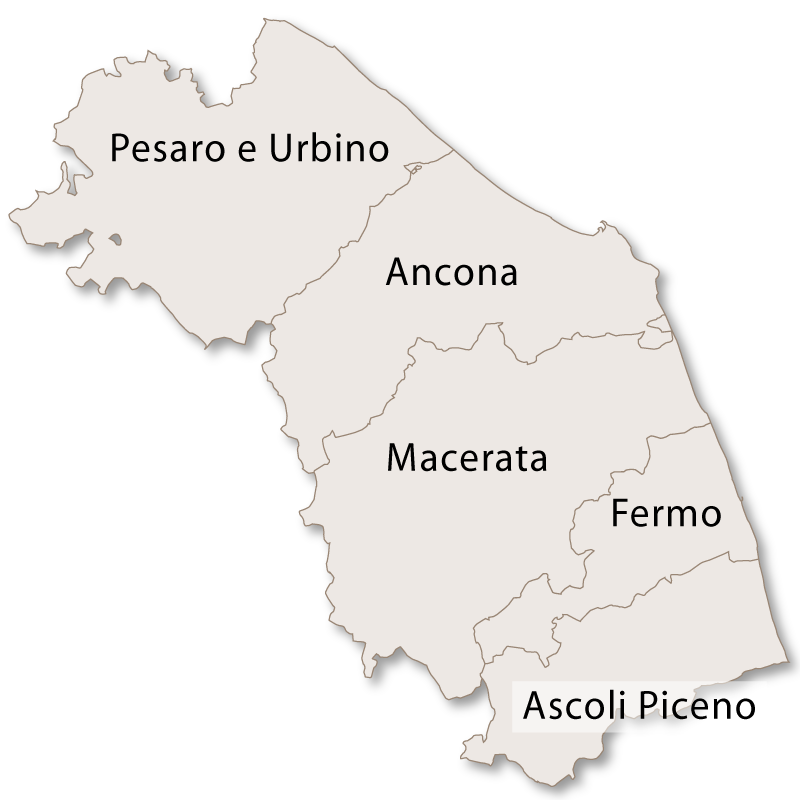 The province of Ancona spreads across the region of Le Marche from the Adriatic coast in the east to the Apennine Mountains in the west. The terrain changes from flat, sandy beaches gradually gaining height across rolling farmland before it finally reaches densely forested mountains. This province contains most of the stunning Conero Regional Park which overall covers around 6,000 hectares of protected land. 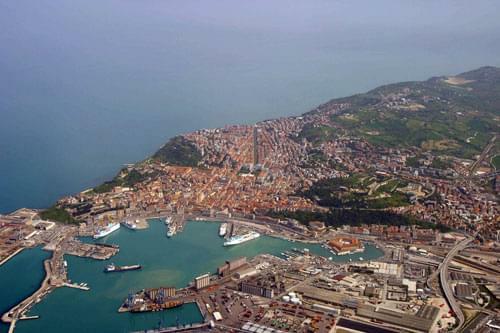 The main airport and port of the region are located in the city of Ancona. 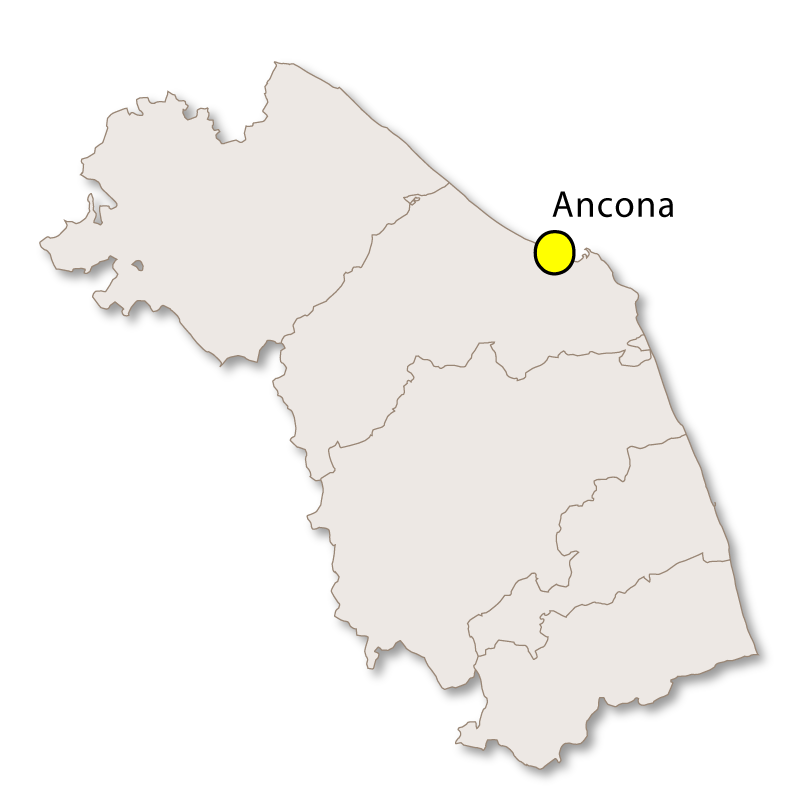 Aeroporto di Ancona-Falconara (AOI) is located about 12km west of Ancona in Falconara Marittima. It is also known as Aeroporto Raffaello Sanzio. The port, one of the main ports on the Adriatic Sea, is located near the centre of the city and is a busy passenger port with ferries running to Greece, Turkey, Croatia, Albania and Montenegro. It has good facilities with a café, shop, restrooms and both short and long term car parks. 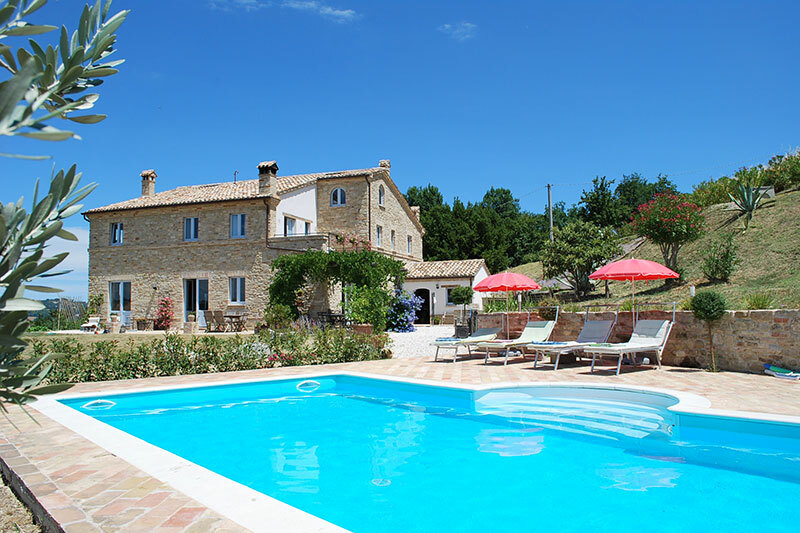 There are excellent train and bus services from Ancona to the rest of the region of Le Marche and car hire is available at the airport. The A14 motorway serves the city. Ancona, a busy port town, is about 280km northeast of Rome and is the capital city of both the province of Ancona and the region of Le Marche. The city was founded in 387 BC by Greek settlers and the name Ancona comes from the Greek for elbow due to its elbow-shaped harbour. In 1915 Ancona was heavily bombed by the navy of Austria-Hungary during the First World War causing severe damage to many historic buildings. Much of it has been restored but large parts were destroyed beyond repair. Standing on the site of the original acropolis of this Greek city, the cathedral has Romanesque-Byzantine and Gothic influences. 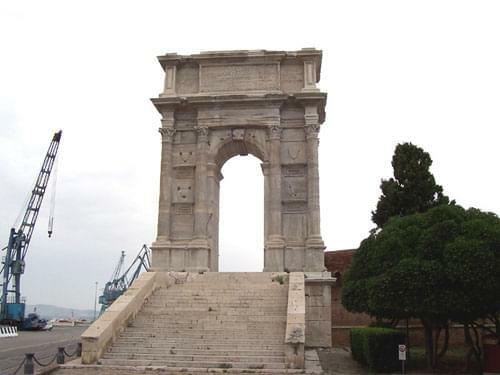 It is built with white stone from Monte Conero with pillars, two supported by lions, made from Veronese red marble. The dome of the cathedral is one of the oldest in Italy. This arch was erected in honour of Trajan, a successful soldier Roman emperor from 98AD until his death in 117AD. It is made from Turkish marble and is 18.5 metres high. It remained in good condition and recent renovations have enhanced it further. This 18th century pentagonal building is called the Mole Vanvitelliana. It was built on an artificial island in the port and is connected to the mainland by three bridges. It was originally not connected to the land is believed to have been built to house lepers. 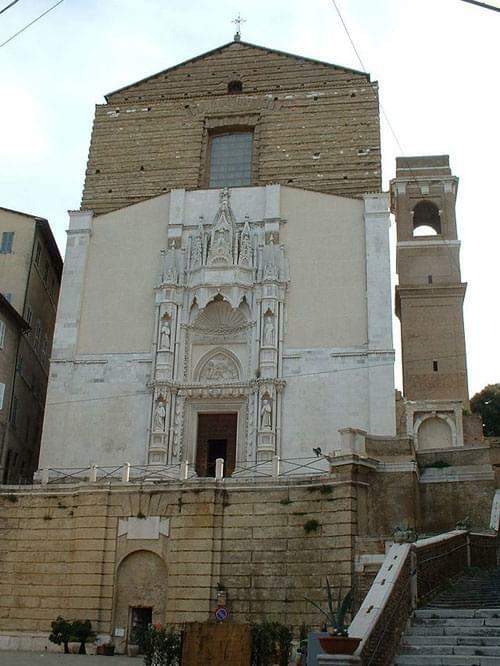 This church was built in 1323 by the Franciscans and was dedicated to Santa Maria Maggiore. After being used as a hospital during the Napoleonic wars it became a museum in the 1920s until it was restored and reopened in 1953. Some other interesting architectural buildings are Palazzo Benincasa, Palazzo del Senato, Loggia dei Mercanti and the Prefecture. The National Archaeological Museum (Museo Archeologico Nazionale) is housed in the Palazzo Ferretti and The Municipal Art Gallery (Pinacoteca Civica) is in the Palazzo Bosdari. There are many pretty and interesting small towns and villages in this region and for a day out some of them are well worth a visit. This town is famous for the production of accordions which are nearly always used in traditional Italian folk music. Other traditional musical instruments, such as harmonicas, are also produced here. Known as the 'green' town due to its flourishing nurseries it has a medieval castle, a beautiful historic centre, a 16th century portal, an archaeological museum and the archaeological park of Suasa, an ancient Roman town. 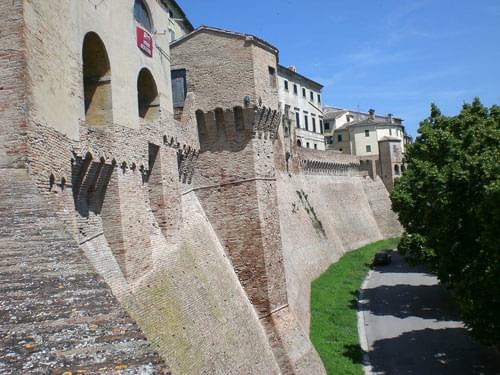 The 14th century walls surrounding the town of Corinaldo are perfectly preserved. The town is also noted for a popular Halloween festival which it holds every October. 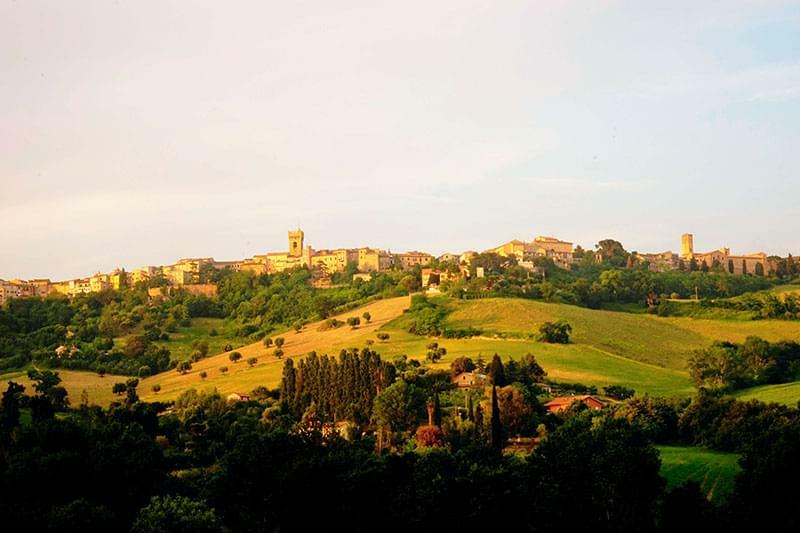 Situated on the main road and railway from Umbria to the Adriatic coast Fabriano is one of the more accessible towns in the mountainous region of Ancona. There are some interesting buildings such as the Palazzo del Podestà, the Sturinalto Fountain, the Communal Palace and the Vasari Portico. It was one of the first towns in Europe to produce high quality paper and there is a Museum of Paper in the town. It is also the headquarters of the domestic appliance company Indesit. Lying 9km north of the city of Ancona this seaside town is famous for its long, sandy beach which is used for beach volleyball as well as beach tennis and soccer. Concerts and other cultural events take place in the Cormorano Park complex to the north of the town and there is also a zoo covering an area of six acres. 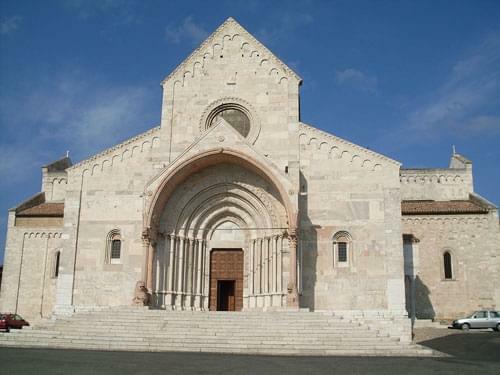 Here you will find the 11th century San Vittore Abbey as well as a Spaelaeo-Palaeontologic Museum which contains a famous fossil of an Ichthyosaur found in the area in 1976. Located about 5km SSE of the town are one of the most visited natural curiosities in central Italy, the Frasassi Caves. 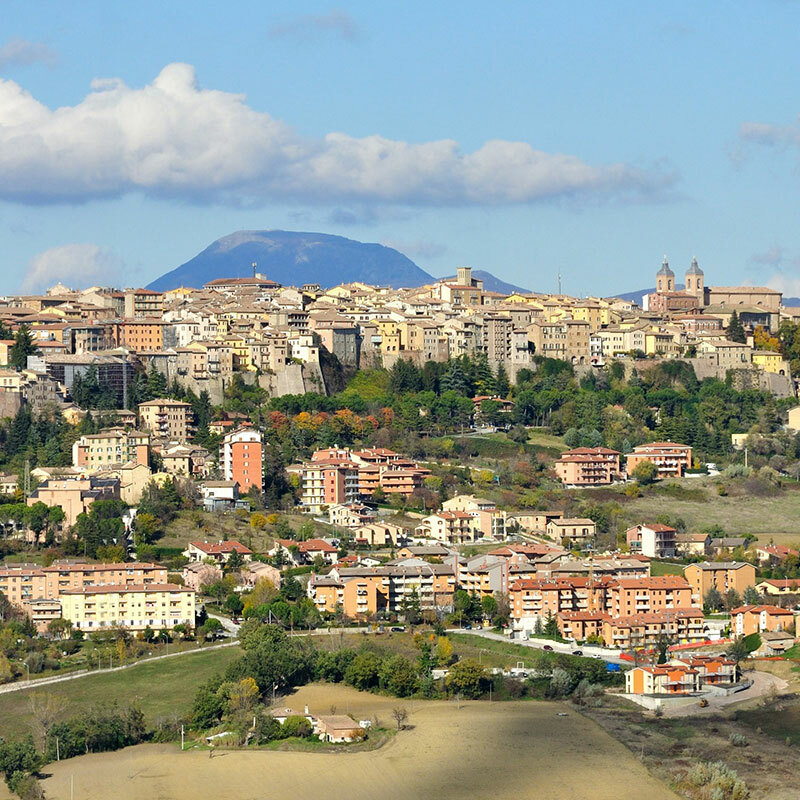 Jesi is one of the more important towns of this region and is and industrial and artistic centre. Enclosed by 14th century walls it has a Duomo (cathedral), an 18th century convent, the Baroque Palazzo Balleani, a Gothic church (San Marco), an i8th century theatre and the Palazzo Pianetti which is one of the most outstanding examples of Italian Roccoco art. This coastal town lies around 15km south of Ancona. It has a restored Romanesque-Gothic cathedral, and a series of underground tunnels with mysterious carvings. A small portion its ancient town wall is still intact. It is famous for its production of silk and the raising of cocoons and silk spinning continue to this day. Mezzavalle - An enclosed cove by the slopes of Monte Conero. It is only accessible via a 20 minute trek along a narrow path down the slope. It is worth the effort to see the white pebble beach, turquoise water surrounded by a backdrop of greenery. Porto Novo - Another beach protected by Monte Conero and again it is surrounded by green and has white pebbles and translucent, turquoise water. It is a popular beach for the younger generation and a favourite anchorage for visiting yachts. Passetto - The white pebbles and clean turquoise sea remain the same as the other beaches but this one is bordered by caves that were carved out of the steep rock in order to provide cover for their small boats and belongings. 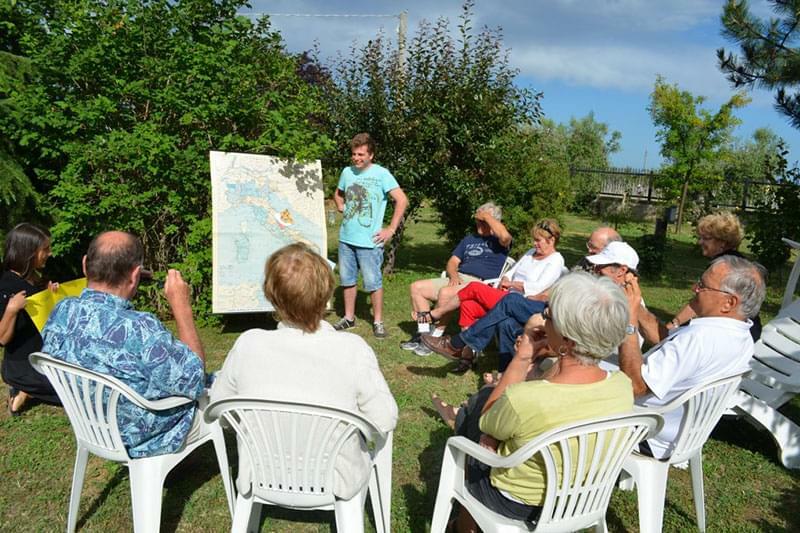 The caves are still used and handed down from generation to generation and the owners are known as 'grottaroli'. Palombina - In contrast, this beach is sandy which makes it much more suitable for families with young children. 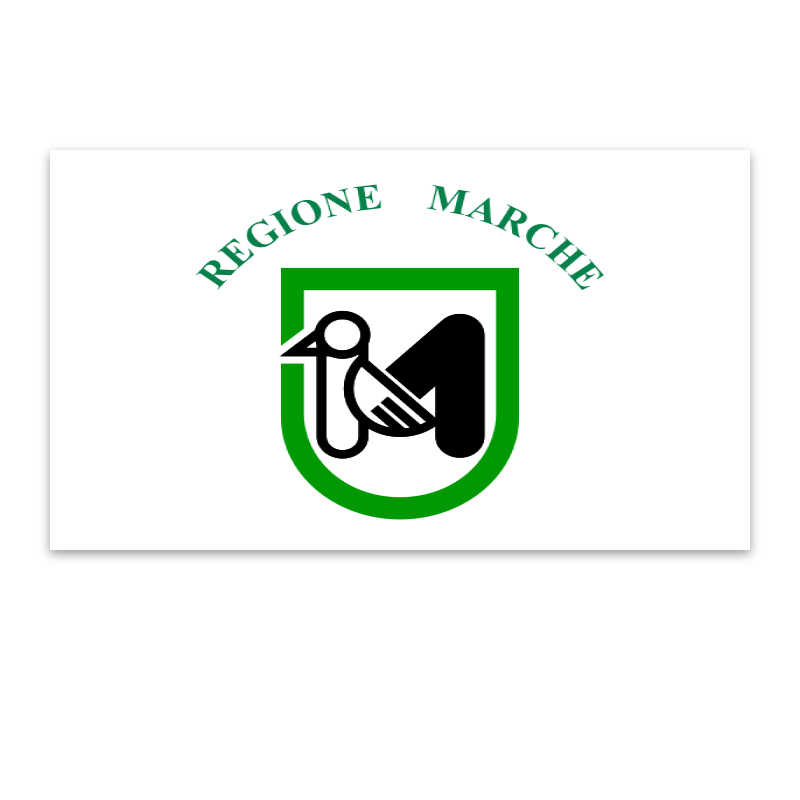 The most famous white wine produced in this province is Verdicchio, made from the grapes of the same name which are grown mainly in the hills around Jesi. A little known, but famous local red wine of this province is Lacrima di Morro d'Alba which is produced in a small area north-west of Ancona. Sangiovese and Montepulciano grapes are also grown in this area. 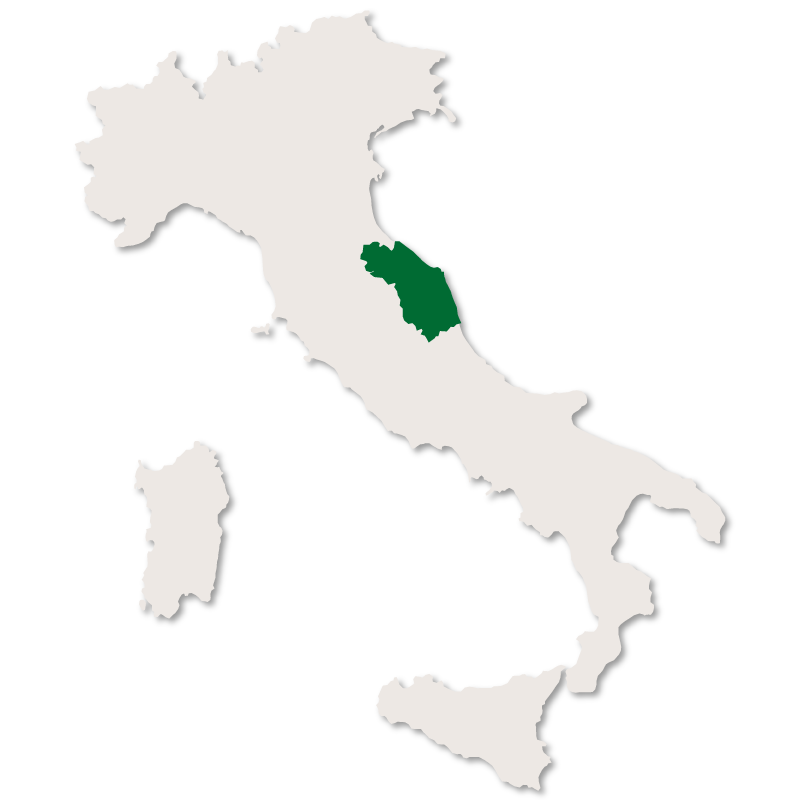 Black truffles are found in mountainous zone of this region and the city of Ancona is famous for its seafood.